The following definitions describe the budget elements that constitute the foundations of the Earned Value Management (EVM) and, though not equal, are aligned with the definitions found in the standard ANSI/EIA-748-B-2007 and the Practice Standard for Earned Value Management - Second Edition - PMI - 2011. This is a concept that comes from the customer/supplier relationship and has been similarly extended to internal projects where it can be clearly identified two parts of the organization: an owner part funding a project (client) and another that executes the project (supplier). The PBB is the total budget that the client has, which is greater than or equal to the budget allocated to the supplier. The difference between these two estimates is called Management Reserve, which is not part of the baseline of the project and cannot be used by the Project Manager, customer unless authorized. There are many definitions of the Reserve Management and not all of them are equivalent. We offer a definition that, personally, I find the right one. I have seen many definitions of this concept that distinguish between known-unknowns and unknown-unknowns. Some of these definitions indicate that the Management Reserve is for unknown-unknowns. These definitions are correct but incomplete. Many projects are contracted leaving all or part of the unknown-unknowns in the hands of the provider. This is a common and legal practice in many industries. In these cases the Reserve Management is still a good practice and has a different purpose. While the baseline may include all project risks, customer risks are not part of the project managed by the supplier. Suppose the project includes a fraction of the scope in mode "time and materials". The risk of a bad estimate in this case is in the client side. The Management Reserve has, in these cases, the purpose of compensating a bad estimate. The customer has in most cases an active role in the project. There is always a "client's project." Its scope is a superset of the project scope and differs at least in a work package of management. Customer participation involves risks to the organization. It is possible that a customer representative to make a mistake when specifying the scope, negotiating the contract or during execution. The projects are made by people and people make mistakes. The effects of the error may exceed several times the personal responsibilities. The Management Reserve allows managing customer risk and often prevents the project to fail for reasons attributable to the customer. The Management Reserve is not a contingency that can be removed from prices in subsequent negotiations, should not be used to absorb cost overruns of the project or used to absorb cost changes. Nor can it be seen as a source of funding for new parts of the scope. It corresponds to an authorized plan including cost, time and scope. It’s used to make a comparison between the plan and project status at all times. The budget considered in baseline consists of the sum of the Distributed Budget and Undistributed Budget. It is a part of the budget of the project baseline that has not been distributed into work packages of the WBS and has not been assigned to control accounts. It is a part of the budget of the project baseline that has already been distributed into work packages of the WBS and has been assigned to control accounts. Not all projects have this kind of budget. It’s also called a “Summary Level Planning Package” (SLPP). It corresponds to a fraction of the distributed budget, commonly assigned to project phases, which cannot be reasonably distributed into work packages or Control Accounts. The budget and scope must be moved from SLPB to Control Accounts as soon as possible and, in any case, before the related work begins. It is a relationship between scope, budget, actual cost and time for comparing the earned value and project performance at certain moments of the project. 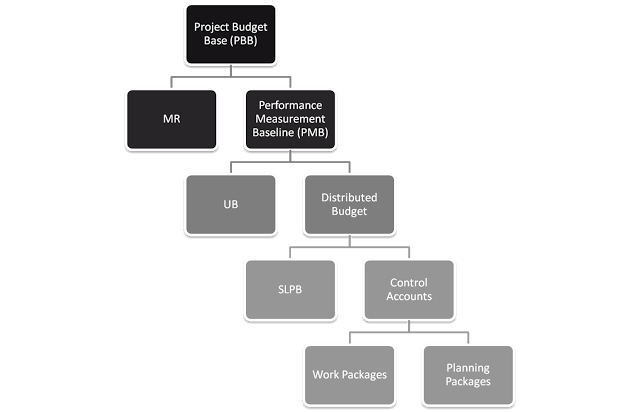 Each Control Account can belong to a single element of the WBS as a single element of the OBS (Organizational Breakdown Structure). It can be broken down into work packages and/or Planning Packages. It is the last level in the decomposition of the WBS. The cost, start and end times and the scope can be clearly identified and managed for a Work Package. Each work package belongs to a single Control Account. It is a fraction of the budget that is distributed to the cost and scope has been identified but has not yet been assigned to work packages. It's associated with future work that has not been planned in detail. Before executing, the associated work of the package planning must be converted into one or more work packages. You may unsubscribe at any moment. For that purpose, please find our Personal Data Processing Policy in the Terms and Conditions page. Project Management Institute, PMI, PMP, PMBOK, PgMP, PfMP, PMI-RMP, PMI-SP, PMI-ACP, PMI-PBA, OPM3, the PMI Registered Education Provider logo and PMI Talent Triangle logo are registered marks of the Project Management Institute, Inc.